Lets face it, there are few things more enjoyable than a long, indulgent wallow in the bath in the winter months. I love nothing more than arriving home, donning my running kit for a quick jog round the block, then climbing into a bath filled to the brim with sweet-scented bubbles. 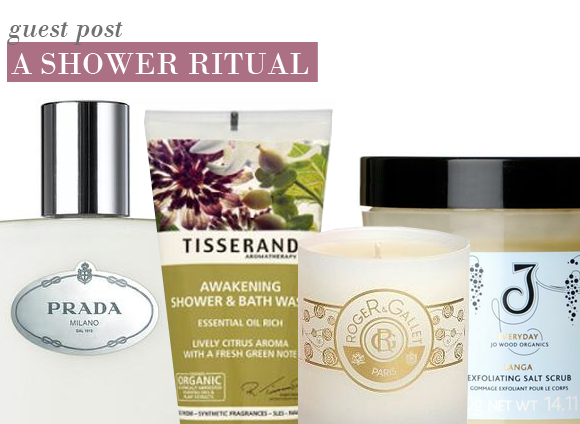 Light… The first – and really quite crucial – component to my shower ritual is lighting a candle. It might seem daft when I only have five minutes, but by the time I climb out of the shower, the bathroom has filled with a zesty, energising fragrance. There are cheaper options out there, but I adore Roger & Gallet Citron Home Candle, £22.50. Scrub… Before I turn on the shower, I spend 30 seconds in the shower cubicle, scrubbing my skin with a thick, salt-based scrub. Exfoliation is always more effective on dry skin – and my skin is left feeling velvety soft. Jo Wood Organic Everyday Langa Exfoliating Salt Scrub, £24, is perfect for the job. Cleanse… The more luxurious the shower gel, the more luxurious the experience… For the ultimate spa ritual, I opt for a Shower Gel that is rich in essential oils. Tisserand Shower Gel isn’t expensive, but is very, very high quality. I love Tisserand Awakening Shower Gel, £5.56. Hydrate… As far as I’m concerned, there is nothing more decadent than heading off to work smothered in an expensive perfumed body lotion. Whether my fellow commuters agree is another thing entirely – but this ritual is about me and the more luxurious, the better. My current favourite is Prada Infusion d’Iris Perfumed Body Lotion, £24.21. this is probably the best caandle in the collection in terms of scenting a room. i'll for sure be buying more of these. This entry was posted on Monday, November 15th, 2010 at 9:34 am and is filed under Bath & Shower, Guest bloggers. You can follow any responses to this entry through the RSS 2.0 feed. You can skip to the end and leave a response. Pinging is currently not allowed.